The singing sisters from the Nationwide adverts have been receiving death threats and hateful messages on social media. Imagine being so offended by something so small you feel the need to spew hatred and wish death upon people. Imagine! Joan and Flo, who are innocently providing an amusing soundtrack to the building society’s adverts, really don’t deserve this level of hate. At all. Nationwide plans to work with the Metropolitan Police to investigate the ‘vile, abusive and misogynistic comments’, which include death threats, according to The Telegraph. The sisters, who are originally from Portsmouth and now based in Toronto, have been featuring in the adverts since December. But some commentators, failing to see the funny side, have been posting abusive messages on social media. Good to see so many people agree that the @AskNationwide adverts are the worst on TV. Of course they do have their fans, who equally wanted to share their opinion on social media. 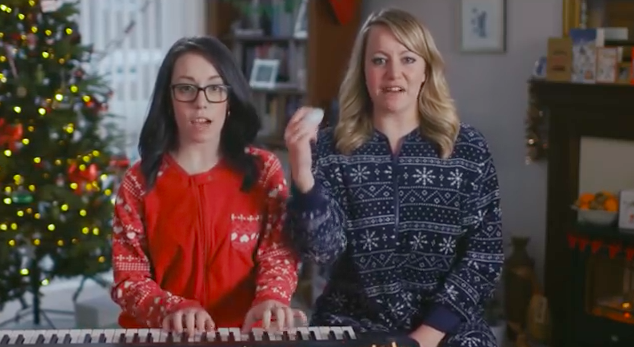 Controversial, but I don’t hate the singing sisters on the Nationwide advert. You ignore the haters, Joan and Flo ?? @AskNationwide i love Flo and Joan who sings songs on the nationwide advert. Do not get rid of them ?? Social media has provided a great instant barometer of reaction – good and bad. The huge amount of likes and shares have been great. But then there are others who have chosen to post the most vile, abusive and misogynistic comments about the duo. It’s not just our Flo & Joan adverts that generate these comments, it’s also our adverts that feature people of different colours, backgrounds and perceived sexuality, which attract the most criticism. That’s why it’s important to call out those persistent offenders who put out vile comments on a regular basis and who should really know better. That is why Nationwide is looking to work with other brands, industry bodies, such as ISBA, and the Met Police to look at the true scale of this worrying trend to spread hate from behind a keyboard and attempt to create a solution to tackle the issue. It’s one thing not to like an advert, another to threaten to kill the stars of it. Abuse is abuse and that’s never OK in our book.